Creme has always been my favorite nail polish finish - there's just something about that smooth appearance that grabs my attention. 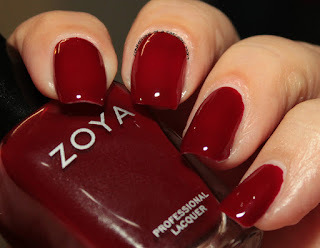 So when I heard Zoya was going to be putting out a collection of one-coat cremes for the fall? SIGN ME UP! 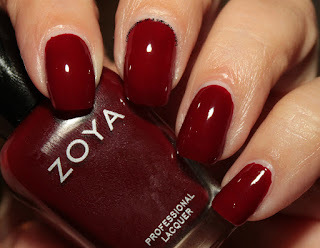 Let's start off with Courtney, a deep blood red that is slightly jellyish. Because this one was jellyish for me, I did need 2 coats. After 1 coat, it was a bit patchy, but adding a second coat was a good remedy. I love this one, and it's absolutely hands down my favorite. It's so juicy and squishy - I couldn't take my eyes off of it. My sister-in-law is named Courtney, so this one is cool! I can't wait for her to try it out. Now Mallory on the other hand is perfect in one coat! So saturated and so gorgeous. But be warned - I had staining. Nothing super bad, but if you don't watch taking it off, it'll invade your cuticles. It is a very beautiful shade of blue, and it is definitely a one-coater! 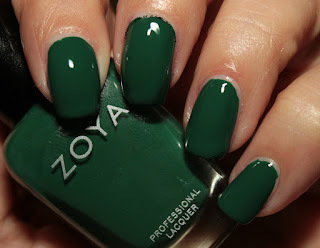 I'm having trouble describing this green - it's Wyatt, and the Zoya website says it's a "racing green." I'm not sure what "racing green" is, but I can tell you it's pigmented! I only needed 1 coat for this one, as well. I didn't have any issues with staining like I did with Mallory, but I see potential for this one to cause some staining. With hints of purple and blue, August pulls an interesting shade of grey on me. It looks like a shade I refer to as "dove grey," and I'm not even sure why. Maybe because it resembles the wings of the morning doves I sometimes see around my house. Again, 1 coat is good! 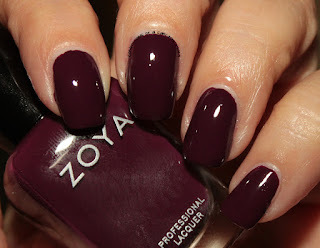 Lastly, we have Tara, a very super saturated plum-y purple. It was sort of thick, and I tried controlling it, but it got a little out of hand in a few places haha It is good in one coat, and I didn't have any staining, but there is potential for staining.